Discussion in 'Homeowner Helper Forum' started by rayjay257, Jan 19, 2019. I have been clearing out the east side of my property trying to get some grass to grow in a bad place. Plus, not having to deal with all the leaves will be a bonus. 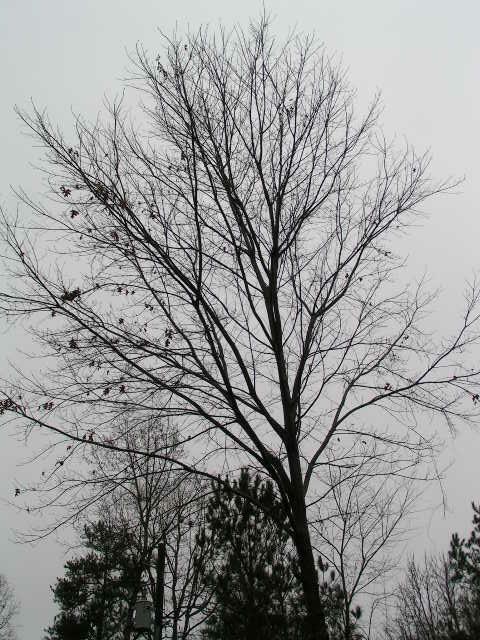 The last tree I have left is the oak in the pics. It has a definite lean towards my house which complicates things. My question is about delimbing or not. The trunk is 11" in dia 6' up off the ground [ just above the fence ]. 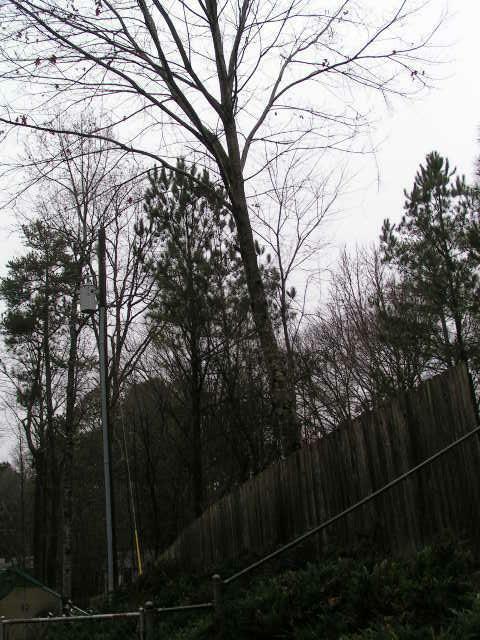 15+ years ago it was topped off about level with the fence and you can see that section of the tree where it reduces in diameter and has a lot of limbs growing up and out [ sadly I didn't cut them all down then ]. It's not really that big of a tree but should I cut off the 6 or 8 limbs that are projecting out to the house side of the trunk ? This would bias the weight in the direction the tree will be felled . I will put my rope way up in the smaller dia section of the trunk. I have 1/2" braided rope from Lowes with a working load limit of 396 lbs. I have and old used rope and will buy a new one for this tree. I have a proper throw line, several heavy duty TufTug 4" sheave blocks and a 'boat winch' with a 5/16" steel cable that I will use to pull the tree. I have felled 8 to 10 trees in this section in the last year. I will post a before pic. Most were 6 to 8" dia at the base and about 3/4 the height of this last one. I understand about notches and back cuts and they all went right were I intended. Only 3 needed the winch. The rest were pulled with Ancra motorcycle camlock tiedowns. 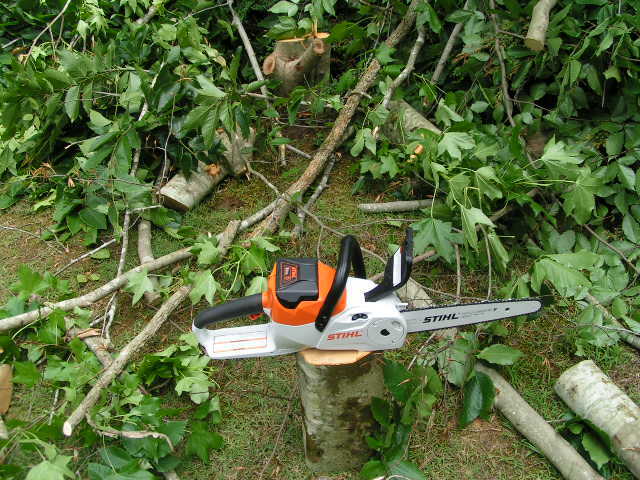 BTW, the majority of the cutting was done with my homeowner Stihl MSA120C. 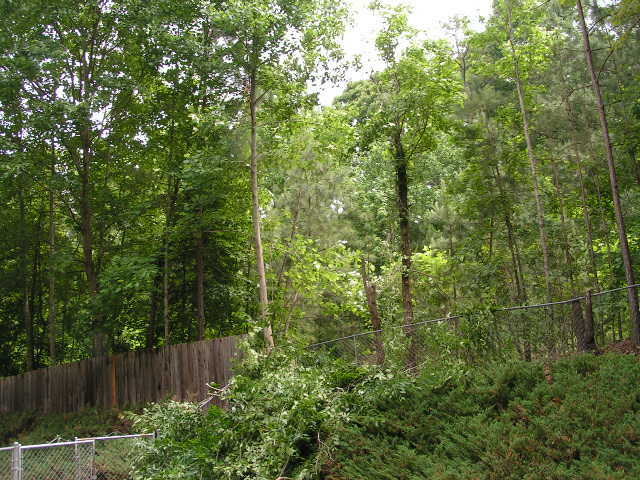 I used the gas saws mostly for cutting the stumps close to the ground. 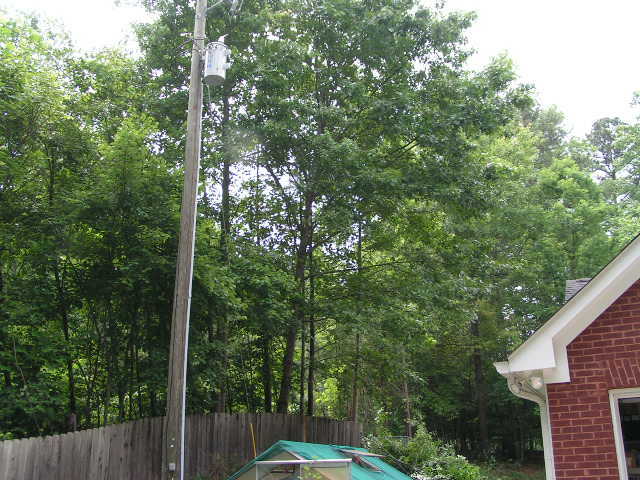 I’d call the power company, they likely take it out for you at no risk to you or their lines. Might not be what you wanted to hear, but even small trees can cause big problems. CacaoBoy and Dahmer like this. I'd yank it out by its roots. All it's doing is taking up space. I'd rope it against the one direction it absolutely cannot be felled with a rope at least 3 times the WLL of the one you have. If there's more then one direction it absolutely cannot fall, roping isn't the solution. Rope anchored and tight, but no tension on the rope until all felling cuts have been made. 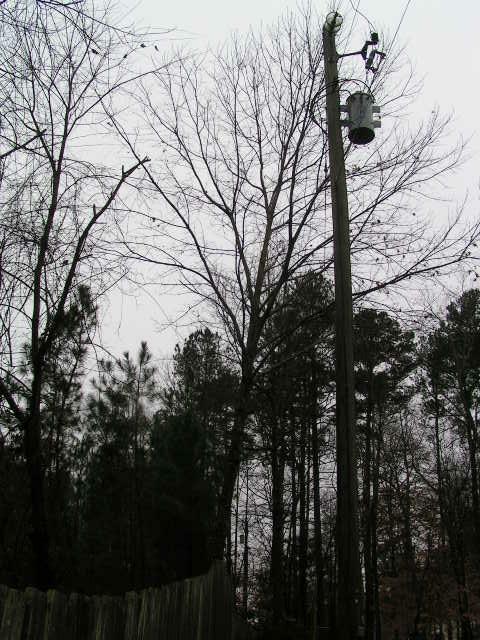 Due to the transformer on that power pole they trim the trees along my driveway every 3 years or so. This tree is too far from the pole and too healthy for them to be concerned about. A neighbor whose family ran a sawmill in the 60s and 70s says he has about 300' of logging chain. I may use this as my failsafe.